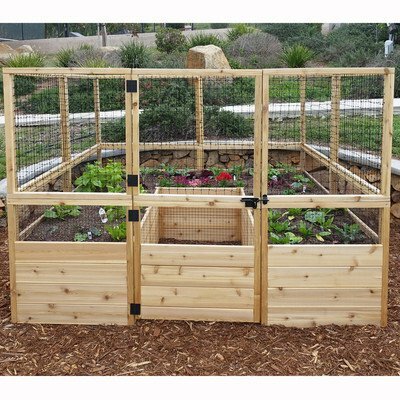 RB88DFO Features: -Pre-assembled western red cedar Raised garden bed panels with wire mesh. -Panels create growing beds with fencing which is backed with wire mesh. Material: -Wood. Color: -Natural Wood. Shape: -Square. Water Resistant: -Yes. Rot Resistant: -Yes. Material Details: -Western Red Cedar. Dimensions: -Panels approximately 33.5" H. -63" L inner walk way. Overall Height - Top to Bottom: -67". Overall Width - Side to Side: -92". Overall Depth - Front to Back: -95". Overall Product Weight: -307 lbs. Warranty: Product Warranty: -30 Days. If you have any questions about this product by Outdoor Living Today, contact us by completing and submitting the form below. If you are looking for a specif part number, please include it with your message.